Opting In vs. Opting Out: Yes, you can have my organs and thank you for asking. I have been a potential organ donor for as long as I can remember. It was a no-brainer for me. If I’m dead, what possibly use could I have for my heart or my skin or my liver? Even if I end up in heaven, with the harps and fluffy clouds and endless wine and ice cream, what do I need with my earthly body? I have always signed my organ donor cards and when my children were born, I signed them up as organ donors as well. God forbid. That was not a decision I wanted to have to make if the worst possible scenario occurred. When they were old enough, we discussed it and I let them make the choice. They both agreed that organ donation was a gift they wanted to give. I have seen the benefits of organ donation and the tragedy that occurs when people don’t get the organs they need in time. Despite all of this, I disagree with my premier’s proposal that organ donation should involve opting out rather than a choice to opt in. They call it reverse onus legislation. The assumption is that you will donate your organs unless you sign yourself out. Years ago, my cable company sent me a notice saying that unless I opted out, I would be getting six new (crappy) channels and my bill would go up by $5. The government actually stepped in that time and said opting out was not good business practice. Hmmm…it’s wrong to be charged $5 extra for bad cable, but it’s OK to tell people that their organs will be harvested when they die unless they sign a piece of paper? I am passionate about organ donation, but I think it has to be a personal decision. Because when it’s your body, it’s your choice. I believe every individual has the right to choose. The right to choose when to die and how. The right to choose whether to give birth. The right to choose whether to take medication or refuse it. As human beings, we are blessed/cursed with free will. For the government to take that away, seems to me, to be a slippery slope. If we let the government take our organs without our consent, where will it end? There are people who need kidney transplants or else they will die. I mean, technically, we only need one. It seems a little selfish for us to be walking around with both when other people need them to survive. So, should the government be allowed to sweep people off the streets and take their kidneys? I think we can all agree that that would be wrong. Organ donation is incredibly important. 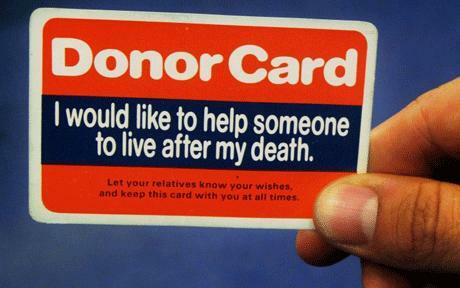 People are dying when they could be saved IF more people signed their organ donor cards. I think schools should introduce the concept of organ donation. Make it a part of basic goodness. 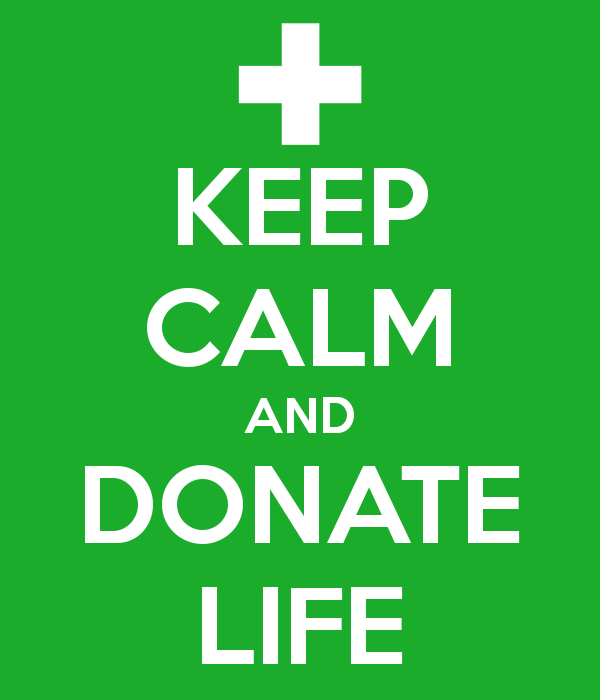 I think there should be bigger and better campaigns for organ donation. A full court press telling people how much good they could do if they just ticked off the box saying they would donate their organs. Show them who gets helped. We should be working our butts off to convince people to voluntarily donate their organs. But as passionate as I am about organ donation (and seriously, you can take anything you want when I’m dead…seriously…pluck my carcass like a vulture…I don’t care, so long as it helps someone else) I am vehemently opposed to taking away someone else’s right to decide what to do with their own body. Take my organs…please! And thank you for asking. I get what you are saying but it doesn’t work as efficiently as asking those to opt out. Too many hospitals never ask a family to donate, or family refuse. Organ donation is a very difficult conversation to have at the bedside of a loved one who only hours earlier was a father, mother, or child. Many are afraid the person is not really dead, or they want them to “die” beside them and go to their grave intact. I think the best scenario is that as part of our health insurance or whatever we should all sign “yes” or “no”. A friend lost her young six year old last year. He became sick and died within ten days. They were at a big hospital and so were asked about donating his organs. This meant keeping him alive an extra day to allow two potential recipients to arrive at the hospital. That detail and the fact they were saying good bye before turning off the ventilator, made it a very difficult decision. They did donate his organs but now understand it is a very difficult decision. I too am happy to let them take anything they want. I agree. Your suggestion about making it part of our insurance is a great one. I was so sad reading about your friend’s son. It is so different to think about something abstractly but when you are actually in the situation….emotions take over. Thanks. They were very brave and take a small amount of comfort for having helped six children. They must be amazing people. My heart goes out to them.